Scout is what happens when a hardware hacker, a designer, and a developer are put on a crash course with the current home security industry. Only 18 percent of homes in the United States have a home security system. It's a miserable process with no alternative. Scout brings you the latest in technology and modern design at an affordable price. Everyone deserves to be protected. 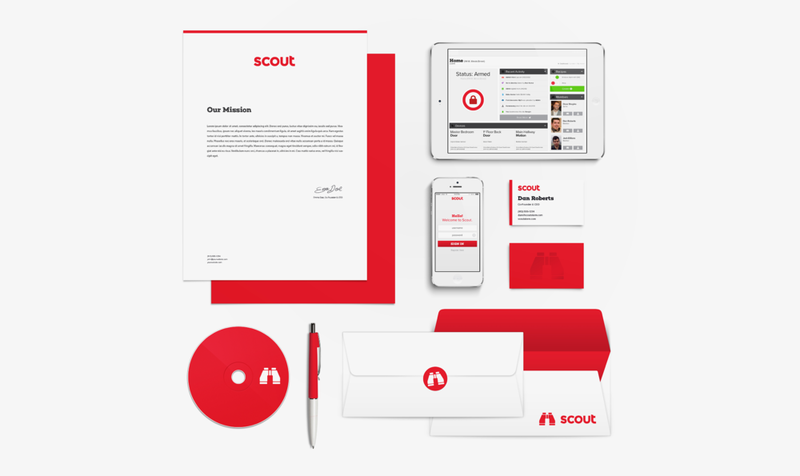 The goal of this project was to rebrand Scout Alarm. Scout wanted to be seen as a legitimate force in the tech startup world and wanted an identity to match. The previous identity featured a bird wearing binoculars with a thin logotype placed underneath. They liked the idea of using a pair of binoculars, but wanted a modern take on the idea to match the sleek, thoughtful design of the sensor products, themselves. Keywords when thinking about this redesign were: simplicity, friendly, clean, and modern. I kept the design simple by making the letterforms very geometric with a uniform stroke width. Inspired by the previous logo, I kept the lowercase 't' for it's friendly and approachable personality. I think the rounded corners on the letterforms also bring a friendly energy to the logotype. Lastly, the bold, thick weight of the letterforms allow it to be seen at both large and small sizes, making manipulation for any interface both easy and effective. The binoculars mark was created to match the look and feel of the logotype through the simple, thick, geometric shapes and rounded corners. It's a great compliment to the logotype and could easily stand on its own as an app icon, etc. Add the above design qualities together, I think the final product is a clean, modern, and thoughtful design ready to be embraced by consumers and respected by the tech industry.